Space Physicist Chanchal Uberoi takes you on a musical journey that is, literally, out of this world. Join her as she travels the solar system, harmonizing Indian Classical Ragas and compositions with the sounds of the Earth, Sun, Jupiter and Saturn. The solar system is full of "sounds" - electromagnetic radiation in audio and radio frequencies. This album is a harmonization of the sounds of the sun and the planets, with Ragas, as visualized by Chanchal Uberoi and performed by -- Chanchal Uberoi (Vocal), Daniel Shurman (Rudra Veena), Pran - Greg Powers (Trombone) & Stuart Dempster (Brass Didjeridu), Chaz Hastings (Tabla), Arijit Mahalanabis (Vocal), Vibhavaree Gargeya (Vocal). Collections of charged particles (plasma) in the sun, planets' atmospheres, and in space interact with the magnetic fields of the sun and the planets, generating electromagnetic radiation. This radiation is detected by instruments aboard spacecraft, and transmitted back to earth, where it can be converted to sound waves and thus audio. Examples of radiation that can be heard in this manner include Whistlers, Chorus, Auroral Kilometric Radiation and Lightning. The space sounds in "Ragas across Space" have been collected by NASA's Polar, Voyager and Cassini spacecrafts, with on board instrumentation built by the University of Iowa. 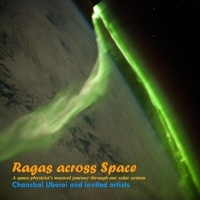 Space sounds in the album have been harmonized with Indian Classical Music (ICM) by Chanchal Uberoi. With the exception of the very last composition, all of Uberoi's tracks start with an improvisation in the Khayal style of ICM, followed by a fixed composition in Hindi, also in the Khayal style. The compositions are about Nature, Krishna and ancient village life. Uberoi has also improvised within the fixed composition, as is traditionally done in ICM. Arijit Mahalanabis' vocal, Daniel Shurman's Rudra Veena, and Pran's Trombone/Didjeridu are improvisations in the Dhrupad style of ICM. There are no fixed compositions. Chaz Hastings goes free form with the Tabla in his first track. In his second one, he is playing fixed compositions, in teen taal (16 beat cycle). The album begins with Vibhavaree Gargeya singing a fixed composition in the Dhrupad style. This composition is about Shiva, who is defined as the beginning, the middle and the end, in the very first line - in short encompassing all of space, and the cosmos. Uberoi thought it was fitting to begin the album with this concept. The very last fixed composition in the album, is a poem by Guru Nanak, set to music by Uberoi. It is a tongue in cheek way of ending the album, because in the poem, Nanak asks - why do you explore externally, when, ultimate reality is inside yourself. Just as the scent of a flower is in the flower, the beauty and answers your seek are in you. Why, then do you explore externally? On crossing the turbulent Plasma media of the Earth's magnetopause, these emissions were detected by the PolarSpacecraft,on 29 May 1996. Intense Radio Emissions escaping outward from the Earth’s auroral region detected by Polar Spacecraft on May 10, 1996. Electromagnetic waves, which are produced by lightning, travel along the magnetic field lines of Earth from one hemisphere to the other.The dispersion of these waves in the plasma media in space makes the high frequencies travel faster than the low frequencies giving rise to a descending whistling tone. Polar Spacecraft, March 26 ,1996. These are associated with the above lightning generated Whistlers, and are heard immediately after them. Unlike the above Whistlers, Proton Whistlers have a distinct slowly rising ascending tone. Saucers are electromagnetic whistler mode emissions detected near the low latitude boundary of the auroral region. These have distinct falling and rising tones, they are upward propagating emissions lasting only seconds, different from the broadband auroral hiss. Polar Spacecraft March 27, 1996 . Auroral Hiss emissions are broad intense electromagnetic emissions which occur over a wide frequency range from a few hundred Hz to several tens of kHz and hence appear as loud Hiss sounds. Polar Spacecraft, May 28 ,1996. Chorus waves consist of a rapid succession of intense ascending tones, rising in frequency over very short time intervals, each tone lasting typically less than one second. They are generated by electrons that spiral along Earth's magnetic field lines in the Van Allen radiation belts.The frequencies of these rising tones occur in the audio frequency range and sound like a dawn chorus of chirping birds . Polar Spacecraft , May 31, 1996. Spacecraft Voyager 1 approached the Jupiter bow shock and magnetopause on 28 February 1979 detecting radio emissions. First the electron plasma oscllations are heard as a series of chirpy noises. Shortly thereafter broadband sounds due to turbulent media across the magnetopause can be heard. These are intense narrow band emissions generated by energetic electrons spiraling along the magnetic field lines of Jupiter and its magnetized moons. Spacecraft Voyager 2, 1979. Emissions detected by Cassini Space craft encountering Saturn Bow Shock on June 27,2004. Saturn is a source of intense radio emissions.These radio waves are closely related to the Saturn Auroras, which are very similar to Earth's Northern and Southern lights. The Cassini spacecraft began detecting these radio emissions in April 2002 when it was 2.5 AU (Astronomical Units) from the planet. Saturn has lightning deep in its atmosphere, which generates strong radio emissions, similar to the cracks and pops one hears on an AM radio during a thunderstorm on Earth. Spacecraft Cassini, January 23-24, 2006, beginning of a strong thunderstorm. These Radio emissions are produced when an interplanetary shock wave interacts with the heliopause (boundary between the solar wind and interstellar plasma). The emissions are detected by Voyager Spacecraft over a period of 22 years from 1982 to 2003. Typically it takes a year or more for the shock to travel from the Sun to the Heliopause but less than a day for the radio emissions to propagate from the source region (the boundary) to Voyager. Dr. Chanchal Uberoi, has had a distinguished career as a space and plasma physicist. From the moment she first heard Whistlers, she has dreamed of harmonizing these awe inspiring space sounds with Indian classical music. She is living this dream by creating "Ragas across Space" in collaboration with Daniel Shurman. Daniel Shurman studied Dagarbani Dhrupad with Jeff Lewis and Uday Bhawalkar, both students of Z.M.Dagar, whose music inspired him to learn the Rudra Veena. He typically does not work on fusion projects, but Chanchal's idea was so unusual, that he decided to open the door and see what it led to. Her background in Indian classical music was a big factor in signing on, both in an artistic capacity of playing the Veena, and as recording engineer for this album. "Pran" is trombonist Greg Powers and didjeridu player Stuart Dempster improvising in the Dagarbani style of Hindustani Music. Powers is the only trombonist in the world performing this ancient style of music. He is a pioneer in adapting Indian music to the trombone and, together with Dempster's droning Brass Didjeridu, creates a hypnotic texture that is true to the tradition. Greg Powers is a disciple of the Dagarbani tradition and has studied with Jeff Lewis, Ustad Farid'uddin Dagar, Uday Bhawalkar, Baha'uddin Dagar and Wasif'uddin Dagar in Seattle and Mumbai. As a Fulbright Fellow to India he studied with Ustad Yunus Hussein Khan in New Delhi. He is a graduate of the University of Washington where he was a trombone student of Stuart Dempster. Stuart Dempster is one of Seattle's musical treasures. A Composer, trombonist, didjeriduist, author and UW Professor Emeritus he prefers the title "Sound Gatherer". When he's not traveling the world spreading the word of "Deep Listening", he shares his gleanings with local musicians, audiences and with an open heart. Chaz Hastings has been nurturing his passion for the Tabla since the age of seventeen. Today, after two trips to India and years of dedicated practice, Chaz is one of the most prominent performers and teachers of the Tabla in the Pacific Northwest. Capable of playing in virtually any genre of North Indian classical or folk music, Chaz can be seen playing for khayal, thumri, ghazal, dhrupad, kathak dance, and instrumental music, as well as performing his own solos on Tabla. Arijit Mahalanabis is a prominent Dhrupad and Khayal artist, based in the Seattle area. He founded the Seattle Indian Music Academy in 2008. He studied under Seattle’s Shantha Benegal, and received much guidance from Prof. Ramesh Gangolli on music theory and composition. Arijit is also a music teacher and researcher, and he now hopes to accelerate his research into various areas of inquiry, including extending the major impact he has had in the documentation and examination of the Bishnupur Gharana of Dhrupad. Vibhavaree Gargeya is a student of Indian classical music, studying under Mrs. Shantha Benegal. When she first heard space sounds, she was skeptical that it would be possible to match them with Ragas and produce anything musical. She was astonished to hear Chanchal's early attempts... the vocals harmonized extremely well with the sounds, creating interesting new music. She signed on to produce the album, and to help in any way she can. She was kindly invited to contribute her vocals to one of the space sounds, and she feels honored to have had that opportunity. Earth, Jupiter, Saturn and the Sun, for singing. Spacecrafts Polar, Voyager, Cassini for carrying instruments to record and transmit their singing. University of Iowa and NASA for the space sounds used in this album. NASA for images used in promotion and artwork for the album. Ustad Zia Mohiuddin Dagar, for bringing Dagarbani Dhrupad to Seattle. Daniel, Greg, Stuart, Arijit and Vibhavaree trace their musical lineage back to him. S.N. Balasubrahmanyam and Kenneth Miller for their input, love and support.